Can a court make a declaration of non-infringement of a foreign patent? Actavis UK Ltd v Eli Lilly and Co  EWHC 1511 (Pat) is a Patents Court, England and Wales, ruling of Mr Justice Arnold on 15 May, which you can read on BAILII here. In a characteristically long, carefully articulated and analytical judgment, Arnold J sought to deal with a number issues arising from an application by Actavis for a declaration of non-infringement (DNI) to cover not only the United Kingdom but also for the French, German, Italian, Spanish and United Kingdom designations of the same European patent. A full analysis of this case has already been posted on the IPKat by Darren Smyth, here. 3. This Regulation shall not apply to evidence and procedure, without prejudice to Articles 21 and 22. (h)	the manner in which an obligation may be extinguished and rules of prescription and limitation, including rules relating to the commencement, interruption and suspension of a period of prescription or limitation. On a proper construction of this Regulation, said Arnold J, the court's power to grant a DNI in respect of the non-United Kingdom designations of a European patent was governed by English law. 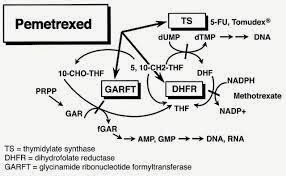 On that basis, he concluded that the intended launch by Actavis of a generic pharmaceutical product using pemetrexed diacid, pemetrexed dipotassium or pemetrexed ditromethamine as a treatment for cancer would not infringe the United Kingdom, French, Italian or Spanish designations of Lilly's patent for a cancer treatment using pemetrexed disodium; it was thus appropriate to grant declarations of non-infringement in relation to all designations of the patent. According to Arnold J, on the proper construction of Article 15 of the Regulation, by which a "remedy" was to be determined by the substantive law of the relevant country, a "remedy" could not extend to any remedy. Under English law, a DNI was little more than a formal record of the court's decision on the substantive issue, but the rules for obtaining negative declaratory relief were regarded as being procedural. Accordingly it was doubtful whether a DNI amounted to a "remedy" within Article 15 at all. Applications for DNIs were matters of procedure within Article 1 of the Regulation and were not therefore governed by the law applicable to a non-contractual obligation in accordance with Article 15. On this basis It followed that Actavis's claim was governed by English law. Under its inherent jurisdiction, the court had a broad discretionary power to grant a negative declaration if it was in the interests of justice to do so because the claimant had a real commercial interest in the relief sought or there was a real commercial reason for it to be granted. Since Actavis had established that dealings in its product would not amount to patent infringement, it was appropriate to grant the DNIs sought. Sen. Patrick Leahy of Vermont, Chairman of the U.S. Senate Judiciary Committee, announced yesterday that he effectively was abandoning efforts to pass a patent reform bill, aimed at curbing abusive litigation brought by patent assertion entities (PAEs, or more colorfully known as "trolls"), this year. Although a reform bill sailed through the U.S. House of Representatives in December, more lengthy deliberations in the Senate bogged down as disparate industry groups could not agree on key provisions. With the legislature facing elections in November, Leahy conceded that efforts to pass the bill would have to wait until next year. The key elements of the Senate reform bill were extremely high pleading standards for patent infringement allegations, imposition of a fee-shifting provision for meritless cases, and the identification of the real parties in interest in an infringement action. Although many companies in the computer technology space, which is the principal target of patent trolls, supported the reforms, the bill faced resistance from other companies once they began to appreciate the practical impact of the proposals. For example, some patent owners complained that the new pleading rules would added enormous cost and delay in filing suits, and could prevent smaller patentees from bringing even meritorious suits. In the end, industry groups on both sides of the issue could not reach a satisfactory compromise. Politico has a concise review of the breakdown HERE. Republicans supporting reform immediately complained that the Democratic leadership in the Senate had succumbed to pressure from the "trial lawyer" lobby. However, it was clear over the last several weeks that a variety of groups, including some major manufacturers and research universities, opposed the broadest reform proposals. The legislative collapse may provide an opening for the courts to demonstrate that they can deal with the troll problem by embracing aggressive case management practices. Many of the reforms in the House and Senate bills tracked mechanisms that currently are within the power of the courts, but are little used. Two district judges in the U.S. District Court for the District of Delaware recently announced revised standing orders to streamline pretrial practice in their courtrooms. Order. In addition, the U.S. Supreme Court’s decision in Octane Fitness and Highmark seem to give district judges greater latitude in awarding fees in cases of abusive litigation. See commentary HERE. If the courts can demonstrate a renewed commitment to addressing the most egregious aspects of the patent troll problem, reforms efforts may have a difficult time building momentum after the 2014 elections. Patent trolls in Europe: a burning issue right now? Forgive the use of "patent troll" in this post -- it is not meant here as a term of abuse or as a term of art, but rather as a loose term to cover the sort of patent owner who has earned the attention of critics and legislators in the United States for seeking to enforce patents that the owner does not itself use, in circumstances that attract their moral opprobrium and outrage. Speaking at the Extraordinary General Assembly of MAPPING yesterday (on which see this and subsequent posts on the IPKat), it was my task to introduce a discussion of the role of intellectual property in Europe, within the context of internet governance, privacy, online security and surveillance. I mentioned various issues in my 45 minute talk, mainly but not exclusively relating to copyright and trade marks, but also patents in the context of Amazon's controversial one-click online shopping patent. During the subsequent discussion I was taken to task for not mentioning the threat of patent trolls. My feeling was at the time, and still is, that while the phenomenon has manifested itself to a large extent in the United States, where the homogeneity of the domestic market and the existence of a single patent to cover it, as well as the infrastructure of federal patent litigation, make troll-based business models which are both attractive and lucrative, the current legal, cultural and economic infrastructure is more fragmented and makes it less easy for such business models to succeed. I also believe that, to the extent that trolling depends on the making of unwarranted demands of licence payments on pain of bringing an infringement action, remedies already exist at national level which address this sort of behaviour. It is easy for someone who is a regular commentator, public speaker and alleged thought-leader to lead himself to believe that what he says is right and that everyone agrees with him, so this blogger thought he'd ask readers of this blog what they think. Does the patchwork of pan-European and national law in Europe, together with its still-divided nature, make the continent a less-than-fertile territory for patent trolling, or is this view outdated or just completely untenable? Do let him know! Jury trials in the US: will the creation of a PTAB cause constitutional headaches? "The creation of a Patent Trial and Appeal Board (PTAB) to preside over quasi-trials of patent validity after the fact at the US Patent and Trademark Office (USPTO) raises substantial issues of constitutional law that have far-ranging implications for both patent jury trials in the US Federal district courts as well as IP trial practice in general. Motions are regularly filed to stay district court litigation to await the outcome of PTAB proceedings. The patent owner therefore stands to be deprived of the right to a jury trial—in an actual case or controversy with a specific accused infringer—due to intervening invalidation of the patent-in-suit by an Article I tribunal acting without benefit of a jury. Hence the jury trial right in patent cases, and by implication in other IP cases involving trade marks or copyrights, now logically seems in jeopardy of diminution. Success of the new PTAB proceedings in reducing the perceived exposure from patent jury trials could lead to similar pressure from perennial defendants in copyright- and trade mark-based industries to seek relief from perceived cost, delay and capriciousness of jury-trial proceedings; with the result being increasing reliance upon administrative determinations on validity by Article I judges acting without juries". There's more on the PTAB here. Do readers agree with Rob's hypothesis? Do let us know. PLC has recently picked up a 2012 EPO Board of Appeal decision that considers exceptions to the legal principle of the prohibition of reformatio in peius in relation to patent claims. Reformatio in peius is the principle, explained in greater detail here, that a decision may not be reached which would put an appellant in a worse position than it was in under the impugned decision) meant that the amendment should not be allowed. In its 36-page ruling in Case T 1843/09 Biaxially oriented film/TORAY INDUSTRIES, INC, 6 June 2012, the Board of Appeal held that the earlier decision of the Enlarged Board of Appeal G 1/99, which provided three precisely defined exceptions to the principle, was not limited to the factual situation underlying that decision, in which it was necessary to revoke a patent as a direct consequence of an inadmissible amendment allowed by the Opposition Division in its interlocutory decision. In this case, the factual situation had changed as the result of the late admission into the proceedings of a prior art document. The Enlarged Board in G 1/99 had made it clear that exceptions to the principle of reformatio in peius were to be allowed as a matter of equity in order to protect a non-appealing proprietor against procedural discrimination in circumstances where the application of that principle would impair the legitimate defence of its patent. This was the situation here, which was unusual in that the deletion of the critical priority-destroying feature was exceptionally justifiable while also respecting the rule that such an exception should only be construed narrowly. The European Parliament today backed the Commission's proposal to complete the legal framework for a Europe-wide patent protection, updating existing EU rules on the jurisdiction of courts and recognition of judgments (IP/13/750). The legislation will also pave the way for a specialised European patent court – the Unified Patent Court – to take up its work once ratified by all Member States, making it easier for companies and inventors to protect their patents. The court will have specialised jurisdiction in patent disputes, avoiding multiple litigation cases in up to 28 different national courts. This will cut costs and lead to swift decisions on the validity or infringement of patents thus, boosting innovation in Europe. Next steps: Ministers agreed on a general approach at the December Justice Council (MEMO/13/1109) last December. The European Parliament's Legal Affairs Committee (JURI) voted in favour of the compromise text agreed in trialogues with the European Commission and the Council of Ministers (MEMO/14/101) on 11 February. Following today's successful plenary vote, the proposal now needs to be formally adopted by the Council in order to become law. This is expected to happen at the Council meeting in June. The IPEC: how does it feel? How is the Intellectual Property Enterprise Court (IPEC) faring? This intriguingly-named court, replacing the much-admired Patents County Court, is currently manned by His Honour Judge Richard Hacon who is taking time off from his serious duties to give us a subjective account of what it feels like to have been six months at the helm. Richard's talk, "Reflections from HHJ Hacon on the first six months", takes place at the London office of Hogan Lovells International LLP (50 Holborn Viaduct, London, EC1A 2FG). 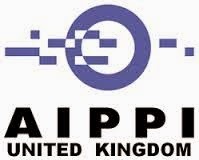 This event, organised by the AIPPI UK, takes place on 22 May 2014 at the conveniently early time of 5.00 pm for the benefit of those who are attending other events later that day. Attendance is free for UK members and new applicants for membership, and £25 for non-members. There are 1.5 hours-worth of CPD points. To attend, just click here. The Transitional Period of the Agreement on a Unified Patent Court (UPC) provides for the options of continuing to use the national courts or opting out of the jurisdiction of the UPC. Both options raise a number of questions which are discussed in this article and which reveal that both options are complicated and possibly dangerous for one or both parties in patent litigation. The author advises that one should not make use of these options but should rely instead on the advantages of the Unified Patent Court Agreement. 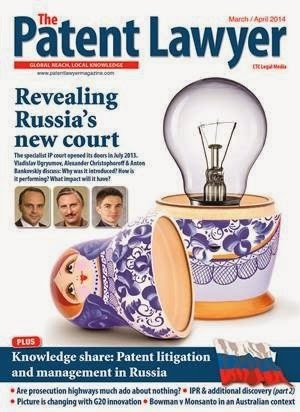 If you are thinking of litigating patents in Russia (and this blogger guesses that most readers of this blog have a long list of items on their "to do" list before they get round to litigating patents in Russia), the current issue of The Patent Lawyer is just for you. The publishers can almost be forgiven for employing the hackneyed symbol of the electric lightbulb on the cover, since they have done something with it that suggests a modicum of inventive step. Further details of this publication can be unearthed by accessing its website here.